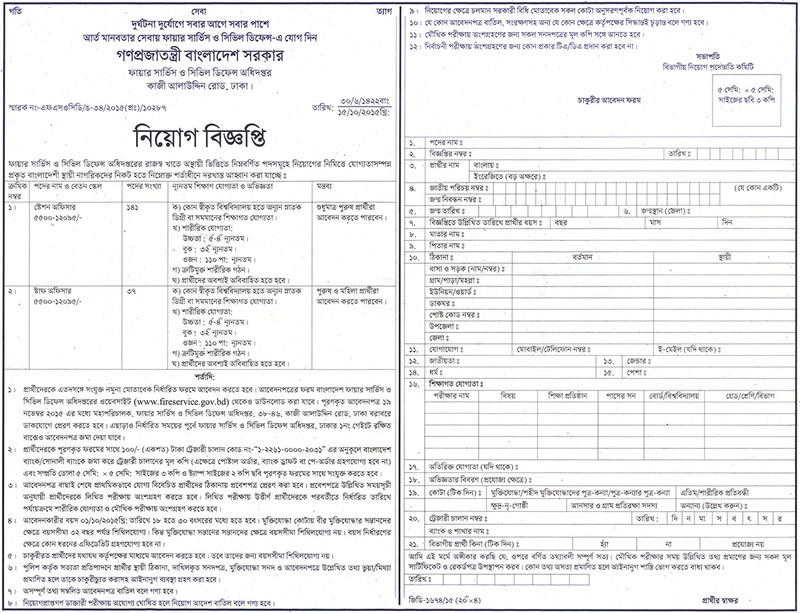 Fire service and Civil Defence job circular 2015 and exam result – www.fireservice.gov.bd. The circular source by daily samokal newspaper of Bangladesh. Last 16th October 2015 has been announced Fire service and civil defence job circular for Bangladeshi male citizenships, who are interested apply here. Fire service and civil defense job number vacancies are 178 and it is the fully Government job. Interested candidates must be application submission between 16th October 2015 to 19th November 2015. After 19th November 2015 any kinds of application not be accepted for these post. Station Ofiicer under total recruitment’s post are 141. The post apply for eligible 4 years master degree at any recognized universities of Bangladesh and interested candidates must be unmarried. And the post interested candidates will be physically fully perfect, otherwise he will be rejected for this post. The post salary 5500 Taka to 12095 Taka. Stuff officer post salary is 5500 Taka to 12095 Taka and total vacancies are 37. The post can be apply male and female both, but must be both are will have physically fit. And both candidates are unmarried. For the post candidates at least complete masters degree in any one universities of Bangladesh. Candidates both post for application firstly download the application form to Fire service and civil defence website. The form download link is – www.fireservice.gov.bd. The application letter will be send to postal media. For apply any post must be do treasury chalan from Bangladesh Bank or Sonali Bank. Primarily selected candidates will be gets admit card for examination of Fire service and civil defence. The admit card will be reached by postal communication. By interview is the last step of selected candidates. But selected candidates can be canceled before medical test. Fire service and civil defence job circular about any information known visits our website and likes our Facebook fan page. The job examination date and results news also to be gets here. The post by share to you know to yours others friends.